Follow ranch's rise to becoming America's favorite dressing in this book loaded with 60 recipes. Move over ketchup, there's a new condiment king. 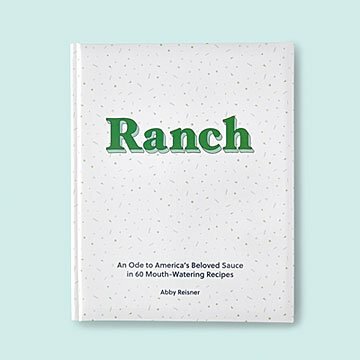 Follow ranch's rise from a mail order specialty to America's favorite dressing in this fun cookbook. It includes 60 recipes, from your basic creamy sauce, to twists on the classic, to food pairings. (The zesty dip + deep fried cheese? Yes, please!) There are even recipes for cooking ranch right into your meals, like mac 'n' cheese and frittatas. The best part for true fans of the tangy treat? The book is loaded with history and facts about ranch. Here's a freebie: It originated in California on a ranch called...Hidden Valley. Made in China.